How to Create Use Cases from Business Process Diagram (BPD)? Current: How to Create Use Cases from Business Process Diagram (BPD)? Identify right requirements (use cases) and stick holders (actor) are important factors to succeed in software development project. This tutorial teaches how to identify use cases and actors from business process diagram. The traceability information between business process model and use case model will be created automatically with the model transitor. Business process modeling is outside the scope of this tutorial. If you are interested to learn how to perform business process modeling, please watch Business Process Modeling with BPMN. Download FireSafetyDepartment.vpp. You can also find this file at the bottom of this tutorial. Depends on how your process model was created, sometimes a task or a sub-process can be 'big enough' to represent a business goal. Through reviewing your business process diagram you can identify the goals as use cases. 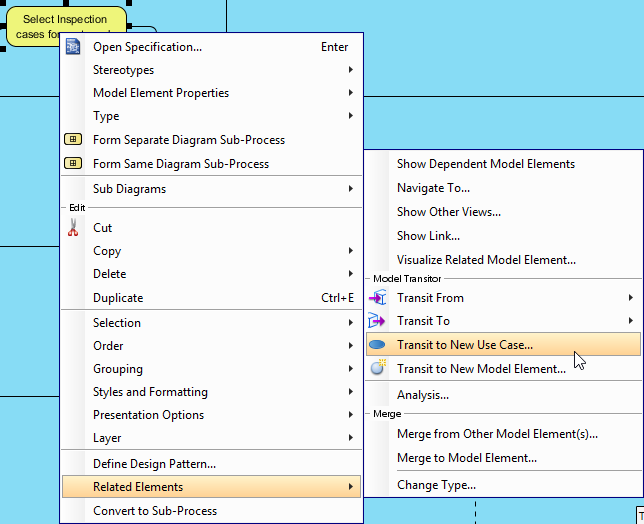 Now, let's create a use case from the Select Inspection cases for next week task inside Regular Inspection To-be Process business process diagram. Right click on the task and select Related Elements > Transit to New Use Case... from the popup menu. We first specify the Model for storing the use case. Click on ... next to the Parent Model field. 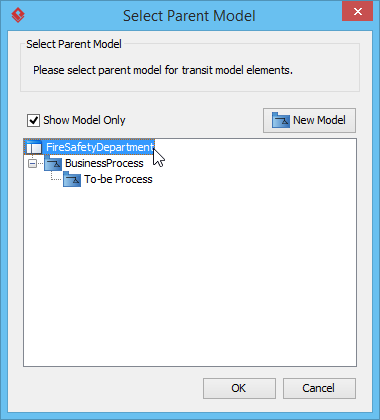 In the Select Parent Model window, select the project node. Name the model as Use Case Model. Click OK.
Click OK in the Select Parent Model window. Keep Transit Parent Lane as Actor selected. This will create actor based on the lane containing the task and link it to the generated use case. 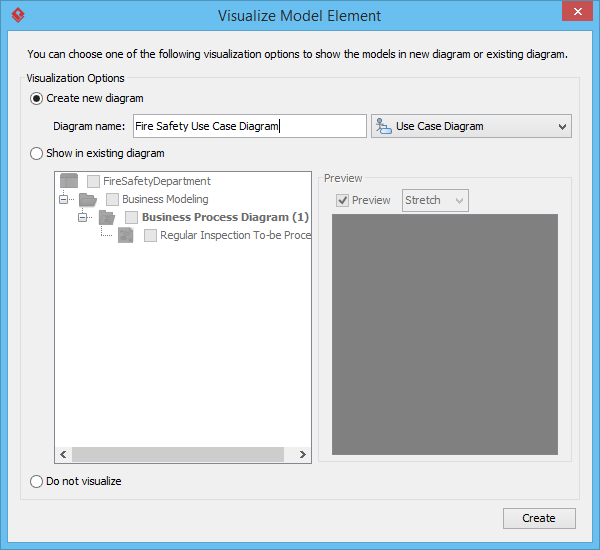 In the Visualize Model Element window, keep Create new diagram selected. Name the diagram as Fire Safety Use Case Diagram. Click Create. A use case diagram will be created. You can always trace between use case and task though the transit resource icon that appear at the bottom right of a shape.